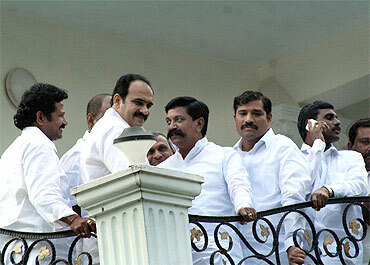 Rediff.com » News » Will Kiran Reddy's govt survive the Jagan shocker? Will Kiran Reddy's govt survive the Jagan shocker? The spectre of political instability has raised its head in Andhra Pradesh with the Kadapa Member of Parliament Y S Jaganmohan Reddy quitting the Congress party. Now all the eyes are riveted on him to see how many Congress MLAs in the state will follow in his footsteps, reports Mohammed Siddique from Hyderabad. Though Jaganmohan Reddy has clearly asked his supporter MLAs not to quit the party, his resignation has started the countdown for a bigger crisis in the Andhra Pradesh's Congress unit and the government. The Congress government in the state has a wafer thin majority as it has only 156 members in the 294-member assembly while the magic number is 148. How many MLAs are with Jagan is a million dollar question. While the party leadership believes that their number is not more than 10, Jagan camps' estimate show the number to be above 25. Even if ten MLAs revolt to be with Jagan, it can plunge the Kiran Kumar Reddy-led government in to a crisis reducing it to a minority. Anticipating such a situation, the Congress high command is already in touch with Praja Rajyam Party chief Chiranjeevi, who has 16 MLAs with him. Thus PRP can save the chair for the Congress. 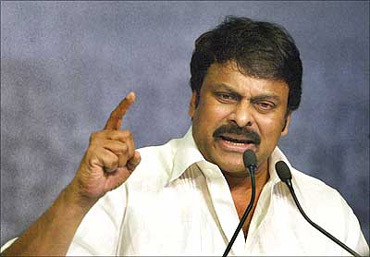 But the party will have to pay a price for Chiranjeevi's support, as the mega star is demanding at least six berths in the state cabinet. As soon as he returned from New Delhi on Monday morning, newly appointed Chief Minister Kiran Kumar Reddy met legislators to discuss the situation. He also met the Governor E S L Narasimhan. Jagan loyalist and suspended secretary of state Congress Ambati Ram Babu has said that Jagan had no intention of bringing down the government in the state because Congress was brought to power by YS Rajasekhar Reddy. "That is why he has asked the MLAs not to resign for his sake," he said. 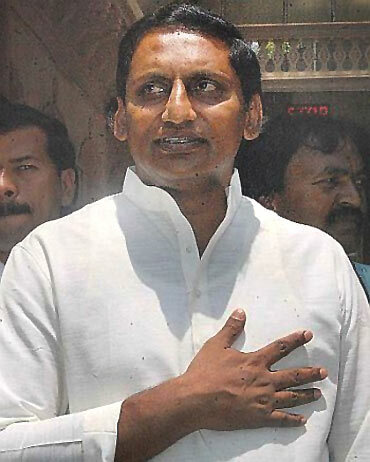 Apart from the legislators, Jagan also has supporters among the members of Lok Sabha. One of them Subbam Hari claimed that there were three more MPs with him. Another pro Jagan MP M Chandramohan Reddy said that Jagan had the supporters of many MPs. If this proves right, then Congress will also face problems at the Centre. Meanwhile, a mob of infuriated youngsters ransacked the district Congress office in Kadapa, Janganmohan's Lok Sabha constituency, destroyed the furniture and office property and burnt the posters and flags of Congress chief Sonia Gandhi. 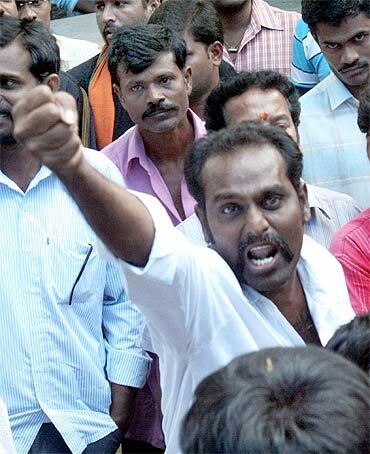 They shouted slogans like "YSR Amar Hai" and "Sonia Gandhi down down". In Tirupati, supporters of Jaganmohan locked the Congress office and held a demonstration in which Sonia Gandhi's effigies were burnt. Similar protests were witnessed in Anantapur, East Godavari, Visakhapatanam and Guntur districts. At some places Jagan supporters also stopped traffic. Hundreds of grass root level leaders including sarpanches, members of mandal parishads and zilla parishads have announced their resignations from the party in several districts. In Hyderabad as soon as the news of Jagan's resignation spread through television channels, hundreds of his supporters gathered outside his residence in Banjara Hills shouting slogans in his support. 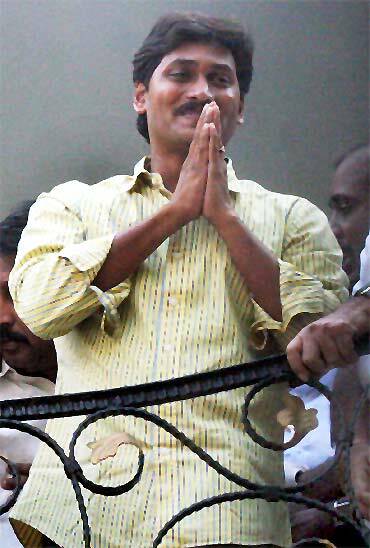 Jagan came on the balcony to wave at the crowds but did not say anything. However, Ambati Ram Babu said that Jaganmohan Reddy and his mother Vijay Lakshmi were forced to quit the party because of the conspiracy to split the YSR family. "When YSR family takes a decision, it is final. There is no question of taking it back. It is like an arrow which never comes back", he said ruling out the possibility of any compromise between the party and Jagan. Will Jagan pull down the AP govt? Jaganmohan Reddy later left Hyderabad for Kadapa by train where he will visit his father's grave at Idupulapaya Estate on Tuesday before chalking out his future course of action. Several leaders of Congress party including Member of Parliament Mekapati Chandramohan Reddy, former minister Konda Surekha met Jaganmohan Reddy in the morning. "It is very unfortunate", Chandramohan Reddy said. But when asked whether he will also resign in support of Jagan, he said such decisions were not taken just like that. "Let me first go through his letter to Sonia Gandhi", he said. He claimed that Jagan had the support of many MPs. Another Congress MP Subbam Hari also expressed pain and anguish over Jagan's resignation and warned that if Congress invites Praja Rajya Party to join the state government, he and three other MPs will be forced to take hard decisions. As soon as the news of Jagan's resignation spread, group of Congress MLAs from Andhra and Rayalseema regions gathered at the Congress Legislature Party office to discuss the developments. J C Diwakar Reddy from Anantapur said that the resignation and any move to float his own party will not do any good to Jaganmohan Reddy. R Damdoar Reddy, a senior Congress MLA from Telangana, strongly condemned the incidents of burning of Sonia Gandhi's photos and cutouts and said that the Congress workers will not tolerate this. Will Chiranjeevi's PRP join Andhra Pradesh CM's new cabinet?